Four sparkling nineteenth-century tales of Parisian high society and rural life, from the father of the modern short story. These four stories were so vivid and enjoyable that my faith in the Little Black Classics range has been restored once more. Connected by the thread of feminine influence, each was written with skill, beauty, and a hint of modernism. It was the russet season of autumn when leaves swirled over the gardens like flocks of birds. Wafting on the air came the tang of damp, bare earth, caught as the smell of a woman's naked flesh as her gown slips down to the floor after the ball. My favourite of the stories was Femme Fatale; the author writes of homosexuality in the nineteenth century, something brave and rare. He passes no comment on either one character's sexuality, nor the other's disgust for it, and simply shows us the flaws and wonders of each of them. 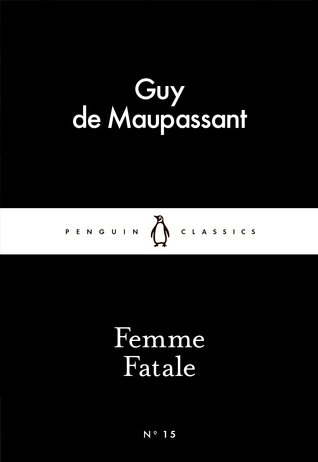 The party setting written by Maupassant reminded me very much of Gatsby, which is something which always tugs at me. The others were just as good, particularly Laid to Rest which has to be read to be believed. I have such a soft spot for Victorian high-society, women, sexually charged motives, and Paris. This is a diamond of an LBC, and I'll be picking up some more de Maupassant in future.